While it’s true that a large number of slum dwellers are poor, it would be a fallacy to relate slums to abject poverty, definitely not one that which rises out of joblessness. Recently, the Indian Prime Minister expressed concern over policemen earning stable government salaries staying in slums (read here). A walk through the slum immediately reveals that its home to a host of professionals that range from call center employees, owners of small-scale industries, struggling artists, daily wage laborers, entrepreneurs etc. If looked at it from this perspective the slum problem becomes symptomatic of an acute affordable housing crisis in a city that requires all this labor. 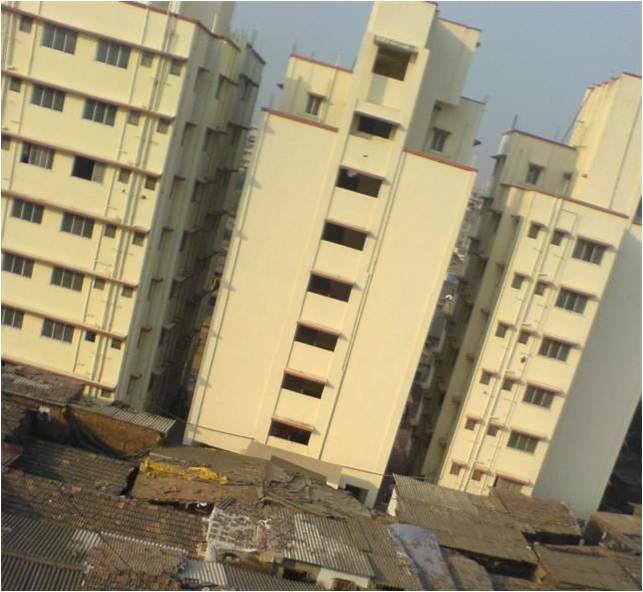 What’s interesting about this is that while there are disagreements about the ways in which the property ownership should be awarded to the slum dwellers, the basic concept of awarding property to the urban poor, as a method of “solving the slum problem” has garnered support across the political spectrum. Both right-wing economists and left-wing activists are willing to support redevelopment schemes if it enables the slum dweller to gain ownership to a house. The redevelopment plan is a self organizing network that is building a consensus among a large coalition of actors which have very disparate interests. This includes the NGOs, slum dwellers, the construction lobby, local government as well as the central government. My interest lies in investigating why awarding property ownership is being seen as a panacea for the urban “slum problem”? In my next set of blog posts I wish to investigate the rationales behind why actors and agents with such diverse agendas have come to support property ownership for the poor through redevelopment models. The intent here is not to demonstrate whether property ownership for slum dwellers is good or bad but it is to explore the conditions under which this idea has gained a common sense agreement. I wish to investigate the regulating fictions that guide this rationale to understand the ways in which consensus is being built, what motives are being achieved and through what strategies and techniques. The attempt here is to highlight the lines of power that operate as well as reveal structural problems with such an approach. A word I borrow from,Rose, Nikolas. Powers of Freedom: Reframing Political Thought. Cambridge University Press, 1999. Print. A word I borrow from,Robinson, Jennifer. “Global and World Cities: A View from Off the Map.” International Journal of Urban and Regional Research 26.3 (2002) : 531-554. Print.